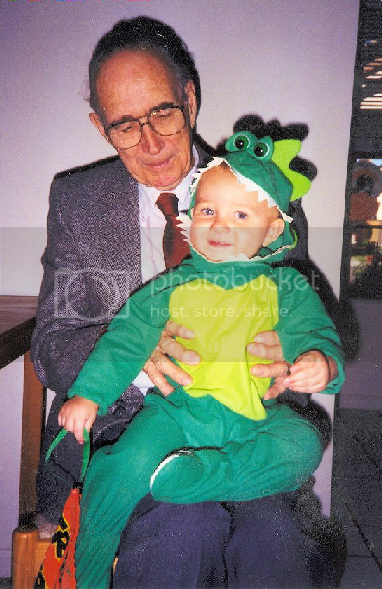 A happy 1990 Halloween: My father, whose birthday was October 30, bouncing a happy little frog (my youngest nephew) on his knee. That little frog celebrated his 18th birthday last Thursday, October 25.
marcia’s last blog post..Wordless Wednesday #17 Which is the Prize Winning Pumpkin? Oh, gosh! Maybe he was a frog. I thought he was a dinosaur, but now that I look at the eyes . . . His older brother was a raptor one year and scared the heck out of my youngest. Maybe that’s what I was thinking of. What a lovely photo and memory. oh my goodness how time flies!! That is an adorable shot. And Miles To Go…’s last blog post..Fall Bloggy Giveaway!! That little baby is so cute. I just loved his outfit. I am sure you guys must have had a great Halloween. Happy Halloween. I’ve left you a treat in my blog today. Mary mert’s last blog post..Spooky! Such a sweet memory. Thanks for sharing! Isn’t that funny? Toddler costumes have really not changed too much over the last 18 years. Happy WW!